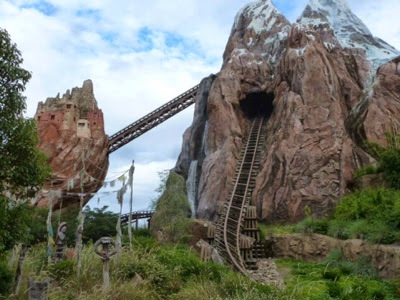 Orlando Visitor: Disney's Mountain in Animal Kingdom Park, Expedition Everest. WDW, Florida. 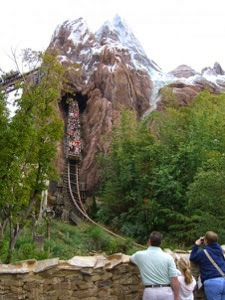 Disney's Mountain in Animal Kingdom Park, Expedition Everest. WDW, Florida. Go to Animal Kingdom and 'Yes' you can have an Expedition on Everest! Well, on Disney's roller-coaster train ride on the amazing construction of a replica of a Himalayan mountain. Before the ride you are taken through a waiting area, telling the story of an expedition with themed artefacts of a journey to a fictional Nepalese village of Serka Zong. Where the atmosphere is created to make guests imagine they are explorers, looking for signs of the mythical 'Yeti'. The roller coaster is thrilling and fun, with height and drop elements adding to the excitement. When it's over you feel you want to go straight back on, and do it again! Labels: Expedition Everest. Walt Disney World Resort. Orlando. Florida. Roller Coaster.